Watch the on demand archive presentation and download handouts by clicking the link below and entering the requested registration information. If you had previously registered for the webinar, select "Already Registered?" and enter your e-mail address. Your students can be more successful in school and life with a larger vocabulary. But what words do you teach? When do you teach vocabulary? How do you teach vocabulary? Learn the answers to these questions along with strategies that will help the brain learn and store words in fun and significant ways. There are three steps in the process of learning words: encoding, rehearsing, and retrieving. Teachers need to use varied strategies that engage the brain for each of these steps. 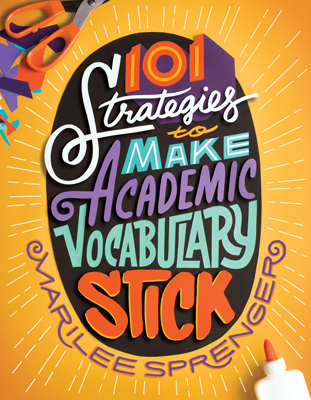 In this engaging webinar, Marilee Sprenger, author of 101 Strategies to Make Academic Vocabulary Stick, will share planning and assessment ideas and suggest strategies that will make your vocabulary program meaningful and enjoyable for you and your students.